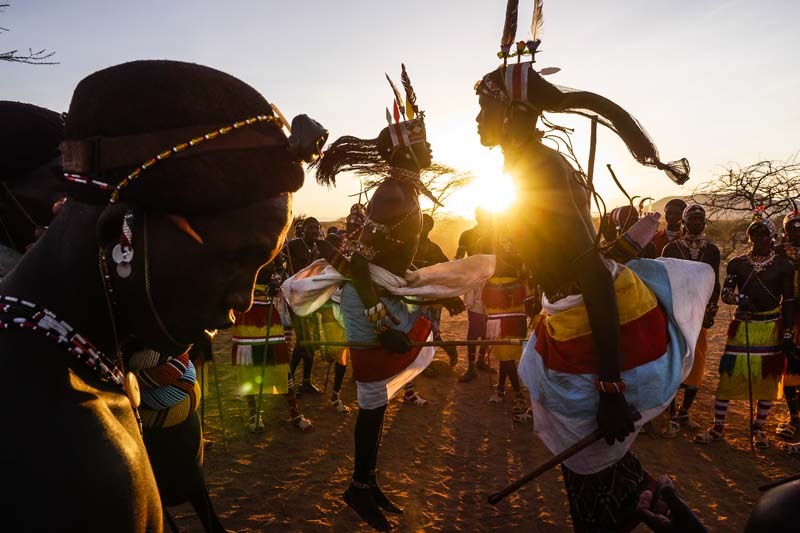 LARESORO, SAMBURU, KENYA - JANUARY 13: Warriors of the Samburu tribe dance as part of celebrations, to demonstrate their physical prowess, during the wedding of the groom Lekambayo, and bride Ndimunyeon, in Larora village on January 13, 2014 near Isiolo, Laresoro, Samburu, Kenya. Traditionally the Samburu economy was purely pastoral, striving to survive off the products of their herds of cows, goats, and for some, camels. However, the combination of a significant growth in population over the past 60 years and a decline in their cattle holdings has forced them to seek other supplemental forms of livelihood. Some have attempted to grow crops, while many young men have migrated for at least short periods to cities to seek wage work.